When I think of the term 'plucky assistant' I immediately conjur up an image of the character of Mrs Peel from The Avengers (the British TV series from 1961-69, not the godawful US movie). Well, not so much an assistant as sidekick and, yes, there is very much a difference between the two - but certainly the very definition of plucky. 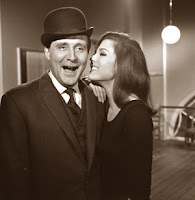 Sadly, I'm no John Steed but I am looking for an Emma Peel. I think I may just need a part-time admin assistant to help me sort out the isues I have with paperwork. I just don't do any. That may be a bit of a stretch but I am appallingly bad in getting paperwork done in a timely fashion. I know it needs to be done and I sit there looking at the stack of files awaiting reports to be written but, hours later, I'll still be sitting there and the stack of files remains untouched. I swear this pathological aversion is a recognised medical condition and, if not, certainly should be! Enter Mrs Peel, or some facsimile of her. Okay, I don't think Mrs Peel would be content doing Steed's typing; she's more into getting her hands dirty and karate-chopping the bad guys all the while looking fab in her catsuit or miniskirted ensemble. But anyway, I do need an assistant (on a very part-time basis to begin with) just to sort myself out. Clearly, I'm not capble of doing it myself. And if she chooses to do the typing wearing a Little Black Dress, well, who am I to say otherwise? Ideally she will be an eclectic dilletante working for the love of it, not the money, since I probably can't even afford a monkey. Still, it might be just the ticket to greater fame and fortune.